Thank you everyone for your support and well wishes. We are very proud of our achievements over the last 12 months and it was wonderful to have them recognised at the recent Mackay Region Tourism Awards. June 2016. With lots of rainfall the property is looking a picture. The goats have really enjoyed the lush pastures. June 2016....A new batch of our delicious relish ready for guests and retail outlets. Our grandson Oscar has become a regular visitor, since his parents have moved back to Mackay. 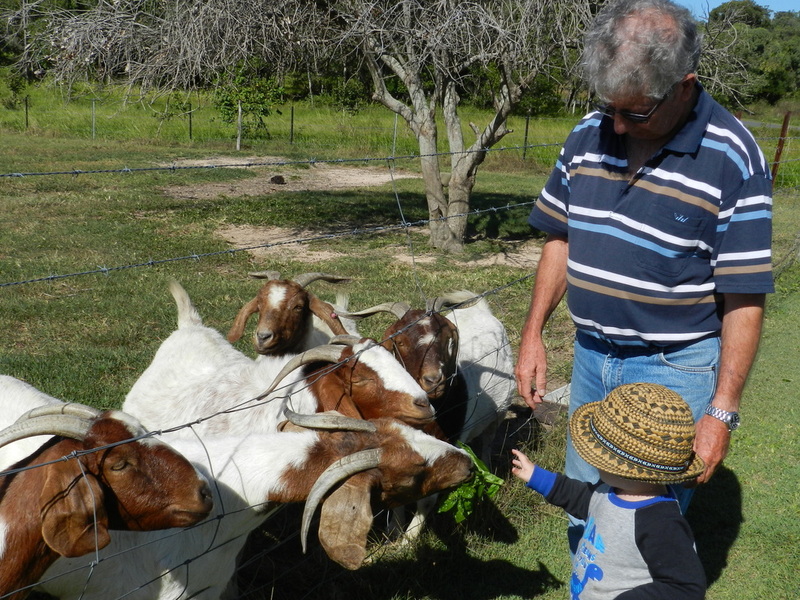 He loves visiting the goats (and his grandparents of course). The grandchildren love playing in amongst the vegetables. March 2016....Our latest guests have designed a an environmentally friendly home for themselves. They are most welcome as we love Sunbirds. After building their nests, the Yellow-bellied Sunbird abandons them for around a week before the female returns to lay one or two greenish-blue eggs. The male will assist with feeding the young once they have hatched. The incubation period is around 14 days, while the survival rate of hatchlings have been recorded as low as 20%. This is largely believed to be caused by predation. Whilst primarily a nectar feeder, this bright little resident feeds its young insects.